NOVA staff attended the Triumph bill signing event held at the Northwest Florida Beaches International Airport in Bay County. 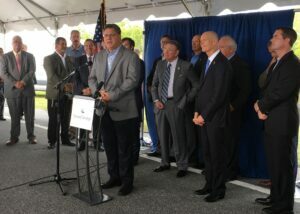 Governor Rick Scott attended, along with other local and state dignitaries, to celebrate this once-in-a lifetime event with the passing of a bill that will forever change the 8 counties along Florida’s Gulf Coast that were impacted by the Gulf Oil spill seven years ago. The funds, which are part of the BP oil spill settlement, can be used on infrastructure to bolster the local economy and grants for tourism and will bring $1.5 billion to Northwest Florida in the coming years. The bill frees up money BP has agreed to pay out for economic restoration of the eight most affected counties — Bay, Escambia, Santa Rosa, Okaloosa, Walton, Gulf, Franklin and Wakulla — from the 2010 Deepwater Horizon oil spill.